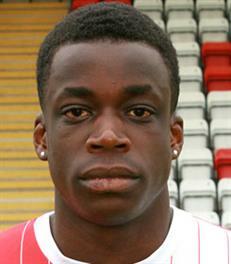 Arthur Gnahoua (born: Bertrand Arthur Gnahoua) signed for the Harriers in the New Year of 2016 after spending most of his career with Macclesfield Town. Following his departure from them he joined CF Gavà (a club in the Barcelona suburbs) but then decided to return to England after failing to make his mark with them. During his time with us he blossomed into an excellent striker with nineteen goals in sixty games but that was to be our downfall and it was obvious that a league club would eventually come in for him. That happened once he declined a new contract with us and joined Shrewsbury Town in mid May 2017. He left there in January 2016 after falling out of favour and spending time out on loan at AFC Fylde. A few days later he signed for Carlisle Utd for the remainder of the season.